Every gardener can use an extra weapon to help in the battle to control weeds. 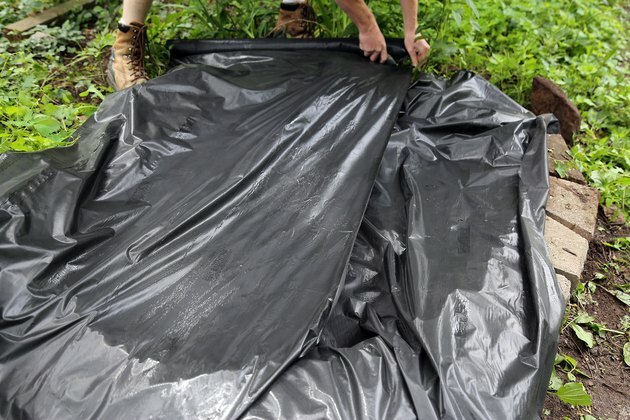 Weed barrier cloth, also called landscape fabric, is one tool you can use for beds, patios and walkways. The meshlike material comes in rolls and is easy to cut to fit the area. Install the weed barrier cloth correctly to maximize its effectiveness. Landscape fabric helps prevent new weed growth, but you can help the fabric work better by clearing the area first. Remove any weeds in the area. Dig up the entire weed plant, including the roots, so it doesn't grow back. Remove the weed plants from the area. Clear away any sticks, rocks or other debris in the area. These items could poke a hole in the fabric and allow weeds to grow. 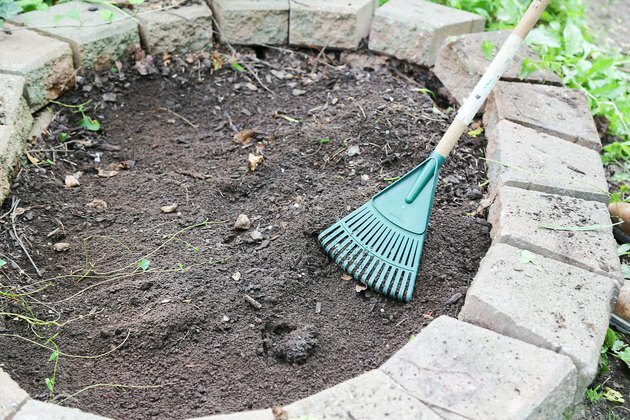 The weed barrier fabric needs to lay flat against the ground to work correctly, so use a rake to loosen the soil and smooth it out. If the area has deep ruts, add soil to fill them in. The weed barrier cloth needs to cover the soil completely to be effective. The edges of the fabric should extend slightly beyond the area you want covered. Once you have secured the fabric, you can cut the excess off. Overlap the weed barrier fabric where new pieces meet by at least 6 inches. The overlap prevents the weeds from growing up between the joints. When laying fabric on curves, such as along a pathway, cut a few slits along the edges to help the fabric bend with the curve. Smooth the fabric as you go to get solid contact with the ground underneath. 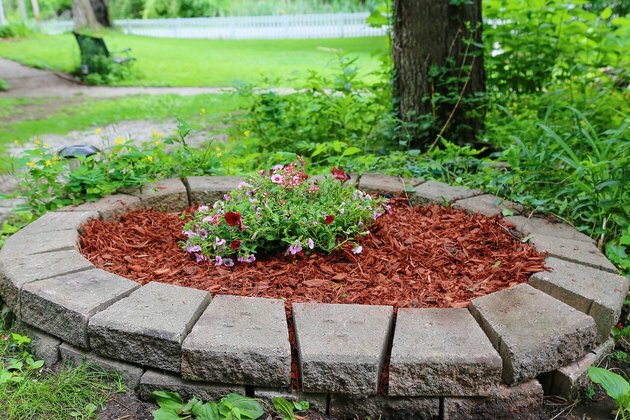 Once you've laid the cloth, you'll probably cover it with mulch, gravel or pavers. 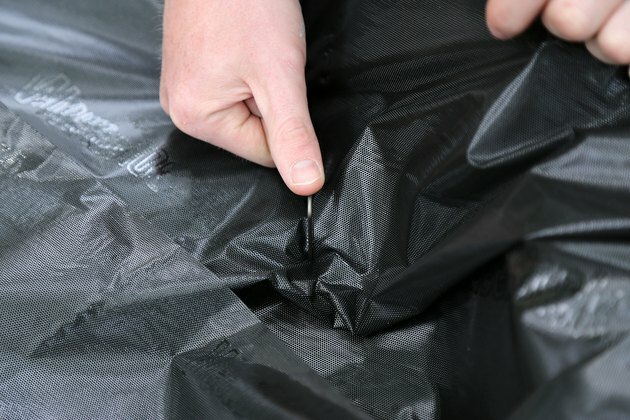 The material that goes over your weed barrier fabric helps hold it in place, but it can shift over time. As the fabric shifts, it may leaves gaps that allow weeds to grow through the covering. Use landscape pins, also called landscape staples, to hold the fabric in place before you cover the area. If you're installing a landscape edging, the pins that hold the edging in place can also hold the landscape fabric in place. If you use landscape fabric in planting beds, you'll need to cut holes for the plants. 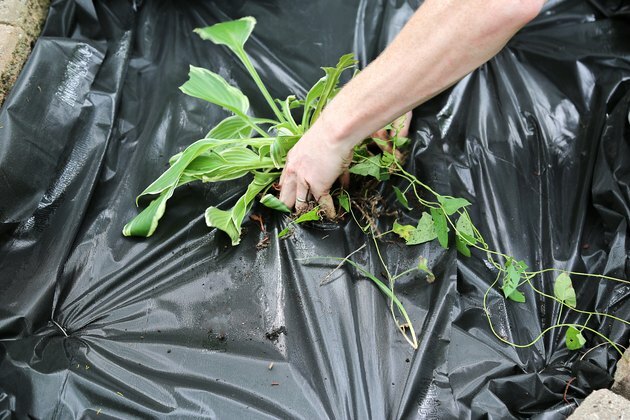 For an existing planting bed, cut the pieces of landscape fabric to fit around the plants. Overlap all of the pieces to keep the weeds from growing. If you're preparing a new bed, lay the landscape fabric first. When you plant, cut a hole just large enough so you can plant. 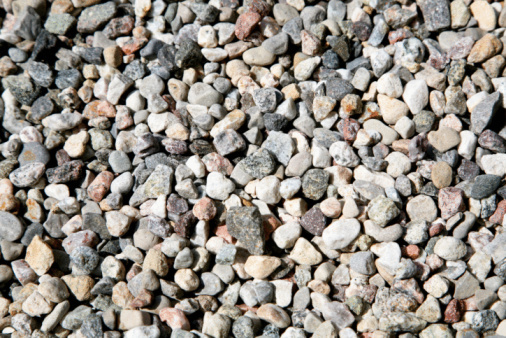 What Do Landscapers Use for Weed Control Under Rocks?